 To understand the ways of linking authentic materials to local contexts in order to develop the students’ critical literacy skills. 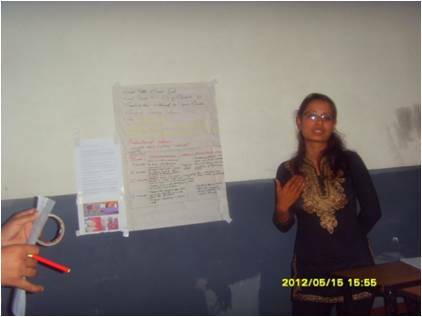  To prepare and demonstrate a lesson plan that includes the use of locally available materials, addressing a critical social issue in Nepalese society, and demonstrates the teaching of language structure(s) (e.g. grammar, vocabulary, communication skills, etc.) based on the mandated secondary school level curriculum/textbook. We went through the following stages in order to deliver the workshop. Materials preparation and evaluation: We (Bal Krishna Sharma and Prem Phyak) first independently worked on preparing materials. Bal Krishna prepared three English language lessons for teaching critical literacy: Domestic Child Labor, Women and Girls in Education and Dowry Practice. Pictures and essays were drawn from newspapers, magazines and other online sources. Prem drew on experiences from his previous workshop on critical literacy at NELTA Conference and a published article on NELTA’s Proceedings (co-authored with Rachel Bowden). 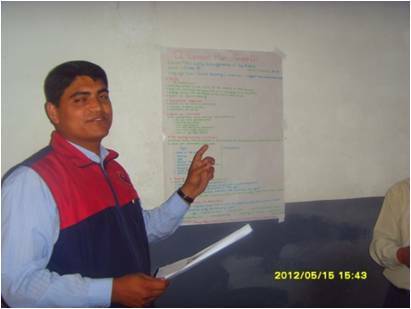 Prem himself took a number of pictures of street children in Nepal, environment pollution in Kathmandu and prepared materials and lessons following OSDE methodology in order to train teachers at the workshop. Drawing ideas and materials from these two sources, we decided to train English teachers who were teaching English at secondary and post-secondary levels. What are some critical issues in teaching English as an international language? Are we isolating the students from or making them familiar with critical social issues while teaching English? Do the activities/texts/ methods we introduce in classrooms really encourage students to engage in dialogs? Do we try to explore diverse ideas or single (so-called right) idea from the students? Are we imposing teachers’ power or liberating students to come up with their own ideas? We talked about Paulo Freire’s ideas on critical pedagogy and his criticisms of banking model of education (Freire, 1970). We made a distinction between traditional transmission model of education and relatively modern view of student-centered teaching. With the help of powerpoint slides, we explained different technical terms used in the field: critical pedagogy, feminist pedagogy, radical pedagogy, transformative pedagogy, and pedagogy of hope/possibility/empowerment (Wallace, 2003). -Read the text and prepare one critical reading question that you can ask your students. -Share with your group members and discuss how you can make your questions more engaging and critical. -Choose one question to share with the whole group. We visited individual groups and overheard what they were talking about. They were discussing how they could make the questions more ‘critical’. Following are the questions that each group shared.  How could you react if a similar situation happens to you at the age of 16?  Why is Sanju Shrestha unable to go home to celebrate Dashain?  Why do you think Sanju does not feel good?  Is the mistress doing good for Sanju? Why (not)?  What are the SLOs and instructional materials?  What are the main components of the lesson plan?  What activities, materials, and SLOs are mentioned in the lesson?  What do pre-reading activities include (page 2-4)? Fill out some slots in page 2, 3 and 4.  What activities are used for the reading text?  What grammar items are focused in this lesson?  What makes this lesson more interactive? How does this address critical literacy issue? This sample lesson plan reading activity started with an individual reading followed by pair and group discussions. We visited individual groups to see if they have any questions. Obviously we wanted to let the participants choose a critical social issue on their own and prepare a lesson plan based on that. However, neither we nor the participants had materials necessary for any open-ended issues. We grouped the participants into four and provided them with the pictures (one example is given below. We took this picture from The Kathmandu Post) and reading texts. 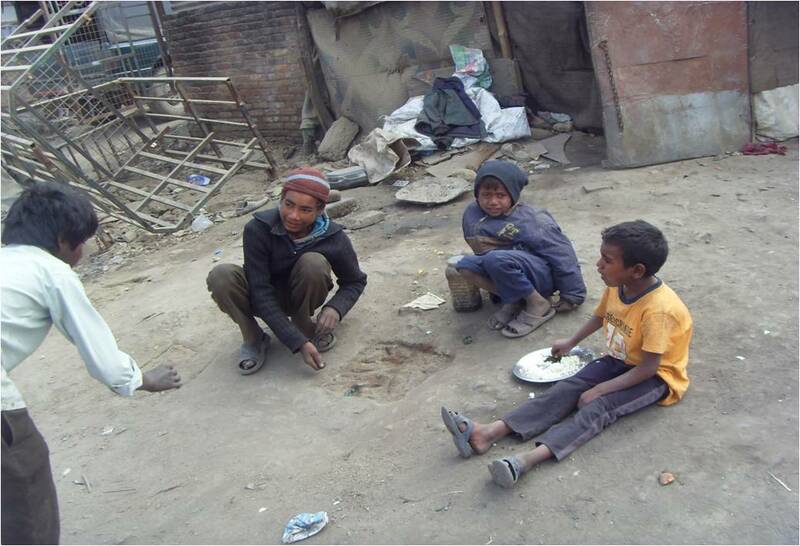 Here are four themes and some pictures we provided: street children, elderly population, pollution, witchcraft practice. 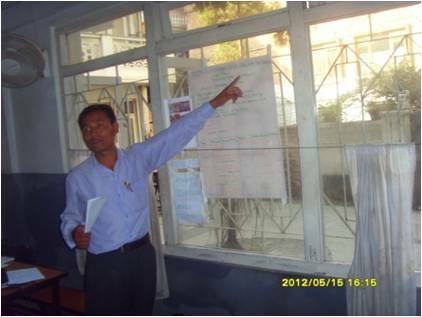 Classroom teaching in Nepal strictly follows prescribed textbooks because students are tested from the textbooks at the end of the academic year. While the English medium private schools make use of textbooks published by international publishing houses like Oxford, Cambridge and Longman, government-aided public schools use textbooks approved and published by the Ministry of Education. These textbooks make very little attempt to encourage local teachers to design their own materials that supplement the textbook topics. There is enough room to contextualize the materials and activities in the textbooks that make connection with the learner’s everybody life in their community. This workshop illustrates that it is possible to teach, for example, vocabulary and grammar and other language skills by linking them to broader societal contexts that the learners are part of. When the teachers include a critical literacy component in their teaching, students do not only engage with language practice; they in fact can constantly take part in making discourses that question or negotiate the power and hegemony persistent in their societies. Here is a response from one of the participants. I learned how to make students active and enthusiastic to read a text themselves. I knew how to engage students in asking and responding critical questions. …. I learned how to organize group works to promote classroom interaction. We can teach grammar from the text (which is related to a critical social issue). We can collect the individual report and share their knowledge among their friends through critical discussion. It helps them to experience a friendly environment in the classroom. I learned how to make an effective lesson plan within a fixed time. 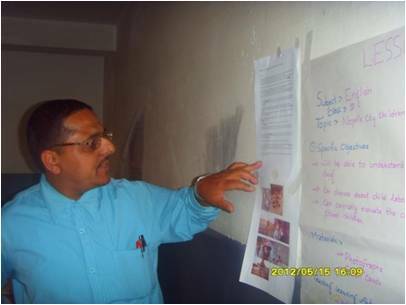 The workshop provided me an opportunity with designing a lesson plan in collaboration with friends. I also learned how to make lesson plans objective oriented and demonstrate them before they are really used in the classroom. Now I feel comfortable to teach in classroom with a lot of contextualization. My students too feel so happy to read actively and creatively. It makes my students curious to know more about their society and interested to share their views in the classroom. Wallace, C. (2003). Critical Pedagogy for language teaching. In Critical Reading in Language Education (pp. 49-78). Palgrave Macmillan, London. Very important theme. Thanks Balkrishna and prem Jees!